I'm really having a love affair with the new fall pieces from Lilly Pulitzer this year! The pinks and blues are just talking to me. The clean lines in an updated style with the longer peplum (far better than last year's seen everywhere but flattered no one short peplum), blazers (love love loving that Campbell! ), bows, lace and longer cardigans. Lilly Pulitzer feels like it's inching back to being old school Lilly with a modern edge. Crossing my fingers they stick with classic, timeless designs moving forward and got that trendy phase out of their system. This season's designs are so delightful! 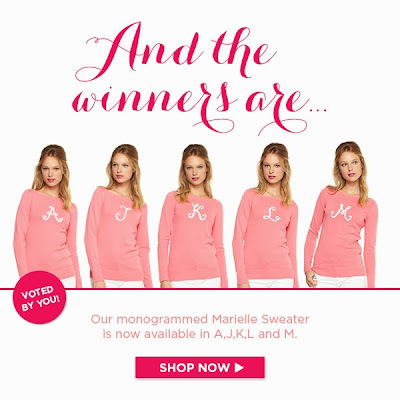 And have I mentioned how excited I am about the Lilly Pulitzer monogram sweaters (that aren't wool...best news ever for this allergic to wool girl) that include a K? Sooo thrilled. A must have for a girl named KK, for sure!